I was intrigued when I first saw Michio Kaku’s recent book, Physics of the Future: How Science Will Shape Human Destiny and Our Daily Lives by the Year 2100, but I didn’t realize at first that it had anything to do with human-computer interaction. 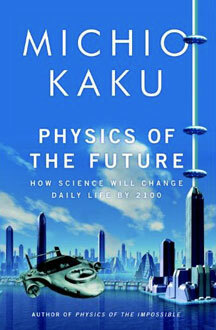 With chapters such as Future of the Computer, Future of Artificial Intelligence, Future of Medicine, Nanotechnology, Future of Energy, and Future of Space Travel, Kaku shows how intertwined technology will be in our lives. Kaku, a theoretical physicist and co-founder of String Field Theory, talked with over 300 of the world’s top scientists in various fields to understand where science and technology is headed by the year 2100. He first addresses the skepticism that naturally arises from previous predictions of future technology. Where are our flying cars and jetpacks that we were supposed to have by now? Those predictions in the past were made by futurists, not scientists. They were not made by studying the current state of science and technology or by talking with experts. In this book, the predictions are made based on current science and where things are headed. It’s definitely a plausible peek into what might be. Though they are fascinating, Kaku’s predictions seemed overly optimistic to me. He didn’t address the big question I kept thinking. How are we going to produce all these great advances when it seems our world is in decline? Every day we hear pessimism about global warming, overpopulation, food shortages, and the lack of energy sources to support the growing populations of the world that are coming to expect a first world lifestyle. However, he doesn’t address these issues until chapter 5, Future of Energy. And even in that chapter he doesn’t seem to have a satisfying answer. His book seems to be an exact opposite of the dismal future proposed in Jared Diamond’s Collapse: How Societies Choose to Fail or Succeed. As someone in the United States, mired in a poor economy, a dysfunctional political system, and endless wars, it’s hard not to be pessimistic that we’ll ever see Kaku’s optimistic predictions come to life. Perhaps these advances are for the “winner” countries that are on the rise, like China. Again, Kaku doesn’t address this until chapter 7, Future of Wealth. And it’s hard to believe how we’ll be able to afford things like gene therapy to cure diseases and extend our lives to 150 years or more. How could our society support that with the current problems with our health care system, Medicare, and Social Security? It’s hard to believe that the average person will be able to afford these things. Will all these wonderful advances only be available to the rich? Although it’s a fascinating look into what might be and an entertaining read, there were too many “yeah but what about?” moments for a skeptic like me to buy into it fully.